Jolly University joined in the fun as Far Eastern University turned up the heat showcasing their culinary creations in a cook-off showdown last February 28, 2014. Product Manager Marilou Acuňa, said that Fly Ace Corporation is very honored to be the sponsor for the Jolly University Cook-Off event. Jolly University is taking the culinary branding to the next level. Everyone were all swept up by the energy and passion that all the contestants had in whipping up their best dishes! Jolly University is taking the culinary branding to the next level. It gives it greater impact by highlighting all of Fly Ace culinary offerings in a major promotion. Jolly Mushroom, Jolly Claro Palm Oil, Jolly Canola Oil are some of the top quality Jolly brand food products. Fly Ace is also the company behind the brand names - Goodlife, Dona Elena, Jolly Fresh, Jolly Cow, Jolly Spreads, Welchs, Franzia and Concha Y Toro wine brands. Foodies themselves, the culinary students are passionate and have the potential to be strong advocates of the Jolly brand. All the participating groups just couldn’t wait a minute longer to sink their teeth into gastronomic works of art. There were 5 teams composed of 3 members each. The amateur competition had three delectable categories – appetizer, main dish and dessert. Competitors started cooking at 10:00 AM. While the 5 teams rise up to the challenge, Jolly-sponsored Chef DJ Santos performed a cooking demo using Jolly cooking oil and canned goods, including Dona Elena Red and White Wines. The heavenly Mushroom and Beef Stroganoff, Young Corn and Mushroom Salpicado and Fruity Blini made by Chef DJ Santos heightened the audiences’ anticipation to have a taste of the culinary treats. The recipes were not ordinary. Most recipes presented had an international influence which made the cooking event more interesting. The recipes were irresistibly delectable. 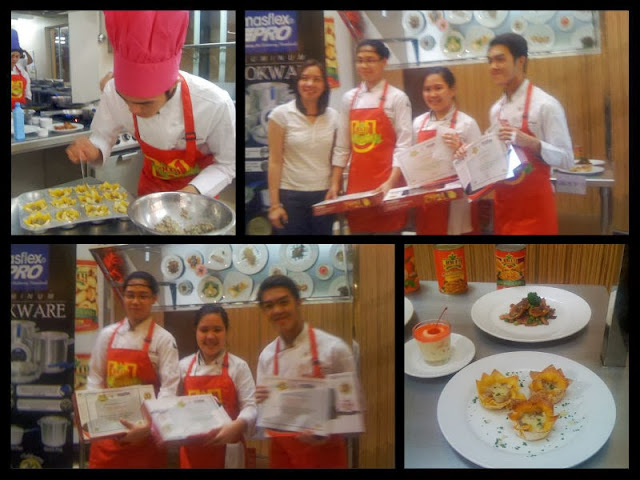 After some deliberation, the 3 chef judges announced that the 5th group emerged as winners for the Cook-Off. They won a cash prize plus a Jolly gift pack, and a Masflex cookware for each team member. The finalist qualifies for the competition slated on March 8.
this is a good marketing strategy for them. it's like doing what carnation and other canned products are doing. i have to admit, i am a sucker for the recipes on the cans! jolly is our preferred brand for our button mushrooms and my husband always gets their fruit cocktail, hehe.